Stucco vs vinyl siding – comparison chart. Which exterior finish material is better? Stucco can be made in wide range of colors, textures and finishes. Vinyl siding is manufactured in enormous variety of colors, textures, and styles. Excellent option for finishing exterior of any outdoor structures. Good material for finishing exterior walls of residential houses. Stucco is a seamless material and has an ability to withstand strong wind much better compare to assembled from many pieces siding. Vinyl siding is a fair wind resistant material. From poor to fair resistance to impacts. Stucco has highest fire resistance rating and it is non-combustible material. Can be easy damaged by open fire or high temperature. Because of monolithic structure, stucco normally not affected by snow and does not accumulate ice. Vinyl siding is insusceptible to rot. Stucco is much more durable than vinyl siding. Stucco is much better choice for energy efficiency compare to non-insulated siding. Non-insulated vinyl siding do not have any insulation ability. 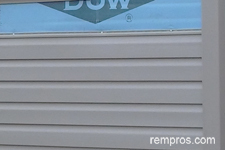 Some vinyl siding has foam insulation laminated of freely attached to the back of each panel. Insulated siding helps to keep heat inside the house during winter time and not letting the hot air penetrate exterior walls easily during summer time. 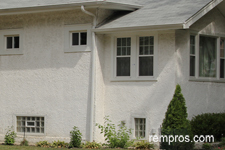 Stucco can last over 50 years with proper maintenance. Normally vinyl siding has 20 – 30 years lifespan. Should be cleaned and repainted periodically to ensure long lasting performance. Minor cracks better to fix immediately. Vinyl siding is a low maintenance material. Limited warranties on materials significantly vary. Mixture of Portland cement, limestone and coloring pigments normally sold in bags different sizes. Typically in boxes 121 – 151 inches (3.1 – 3.8 meters) long. Depends on thickness, but stucco in combination with wire mesh or fiber cement boards is much heavier compare to vinyl siding. Stucco mixture and additional materials for its proper installation vary, but it is more expensive product compare to vinyl siding. Vinyl siding is one of the cheapest house exterior finishing materials. Charges to install vinyl siding are lowest compare with any other house exterior finish materials applications. Could be a challenging task, normally not for do it yourself applications. Adequate preparation and application of stucco on 21 - 26 squares of two story house with simple walls normally should be completed by a crew of four in 5 to 7 days. Crew of 3 normally is able to install 24 - 28 squares of vinyl siding panels in couple days. Replacement might take 3 to 4 days. Depends on damage. Typically minor cracks can be easily fixed with partial application of stucco mixture on damaged area and coated with acrylic latex coating. Some damages could be hard to fix. Vinyl panel can be easily removed and replaced with a new one. Stucco absorb moisture and omitting periodical recoating and ignoring regular maintenance might cause unsticking actual stucco from backing material or cracking. 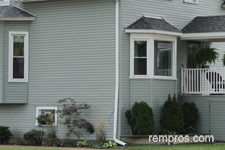 With changing temperature vinyl siding has an ability to expand and shrink. If siding installed tight it can start bucking. Too loose installed siding can be easily blow off by strong wind. 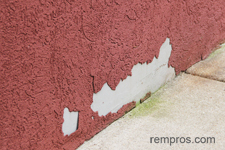 Discoloring normally is a result of poor maintenance or low quality of siding itself. Stucco and vinyl siding have their own advantages and disadvantages. It is hard to say which material is better because it depends on many factors. With adequate application and proper maintenance quality stucco have longer lifespan, better resistance to severe weather conditions and much higher thermal efficiency compare to cheaper and easy to install vinyl siding. But low initial cost makes vinyl siding much more attractive for majority of homeowners.